Blueberries, that luscious, sweet treat of mid-summer, are much healthier for you than you may think. These berries are high in fibre and nutrients like Vitamin C and Vitamin K, and, a bonus, are low in calories. So, what does that mean. Basically, blueberries are very good for you, no matter how you eat them. Blueberries protect the cholesterol in the blood, they lower blood pressure and help prevent heart disease. They are also good for the brain and help in improving memory. Need I say more? There’s a lot of good stuff in this small berry that packs a healthy and tasty punch. So why not use blueberries in all parts of your daily diet? It’s not just a berry for dessert. Blueberries are good in breads, pancakes, salads, chutney, and glazed on meat, poultry and more. But, of course, blueberries are especially good in cakes, cookies, ice cream and beverages. Need some ideas to add to your blueberry cuisine? 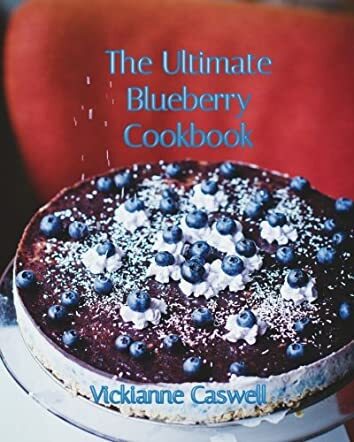 Vickianne Caswell’s cookbook, The Ultimate Blueberry Cookbook, is packed full of delicious blueberry ideas. Complete with some interesting facts on the little berry, the book is well organized, with recipes for various food groups like beverages, breakfast, cakes, cookies and so on. Each section contains several recipes to consider and hopefully try. The recipes are well laid out and easy to follow with concise directions after the list of ingredients. This is a great addition to any cook’s cookbook collection. Each recipe, mouth-watering as it is, entices the reader to want to try them all, and then to enjoy.